Planting olive trees is an important part of spring for the 80,000 families in Palestine who depend on the olive harvest for income. Photo EAPPI/J. Byrne. It’s 9:00 am on a warm sunny morning in Burin. The weather is unusually mild for the time of year and the farmers are complaining about the scarcity of rainfall. We’ve been asked to accompany the villagers while planting new olive trees to replace the ones Israeli settlers from the Yizhar settlement destroyed. Our transport arrives: a tractor and trailer containing about 50 olive tree saplings. The many passengers make room for us as we climb aboard and, precariously balanced, we set off on a 2 kilometre long journey across the valley and up a steep incline to arrive at a ploughed field just 300 metres from the fence surrounding the settlement. Mamoun, from the rural development association in Burin and also one of the coordinators of this event, shows me the blackened remains of olive trees burned by Israeli settlers in an adjacent field. He believes in a conspiracy theory that I’ve heard before: that this arson is not a random act but part of a coordinated attempt to undermine the Palestinian rural economy. He explains that “they know what they are doing. There is some genius thinking for them”. He also cautions us that farmers are often “beaten” in this area, especially if they get too close to the fence. An EA helps carry olive tree saplings for planting olive trees in Hebron. Photo EAPPI/A. Forsberg. An EA accompanies olive farmers planting trees in Azbat at Tabib. 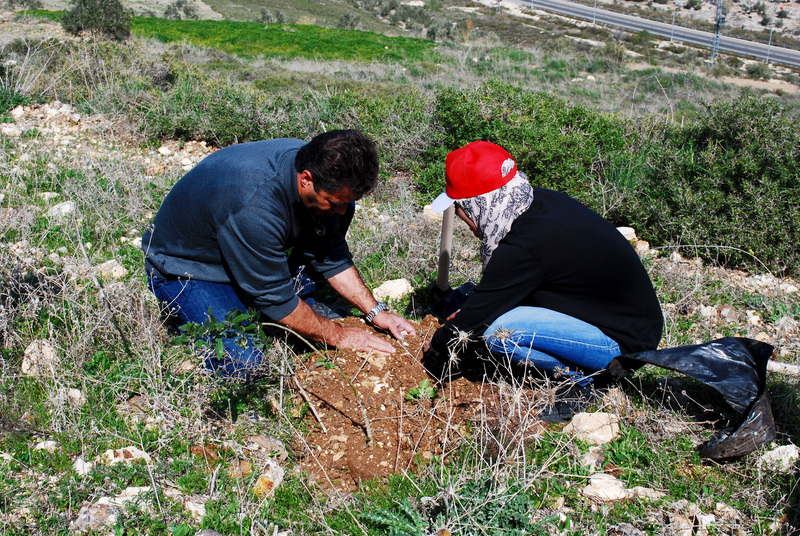 Planting olive trees is a form of nonviolent resistance. Photo EAPPI/J. Byrne. Palestinian farmers and internationals plant olive trees after Israeli settlers uprooted them in Azbat at Tabib. “For every one tree they [the Israeli settlers] destroy, we will plant ten trees more”, Mamoun in Buring says. Photo EAPPI/J. Byrne. Tree planting is laborious work. EAs accompany farmers planting olive trees in Sebastiya. Photo EAPPI/T. Laakso. A father in Burin plants an olive tree in memory of his 3 year old son who died from brain cancer. Photo EAPPI/P. Kaegi. An EA helps plant an olive tree in Urif. Photo EAPPI/C. Heberlein. There is more to this event than just planting trees: it is both a memorial and a political statement. Attached to the saplings are photographs of Palestinian nationals. Some are long-term prisoners in Israeli jails; others have died in resisting the occupation. One photograph is of a local boy, aged about 10, who recently died of a brain tumour in spite of eventually receiving expert Israeli medical care. I realise that the man standing stoically alone in front of the tree is the boy’s father. At the risk of intruding on his private grief, I offer my condolences on his loss and a prayer for him. He thanks me for my concern in a most dignified way but then continues his vigil. Planting trees is hard, sweaty and tiring work and our team pitches in. At a scheduled break I search for a stone to sit on, mindful of an earlier conversation with Mamoun about the local flora and fauna in which he mentioned that there were “many snakes” including a “Palestinian cobra”. Mamoun senses my anxiety: “don’t worry”, he says, “it’s winter and they’re sleeping”. I ask Mamoun about his organization. He explains that it’s primarily concerned with improving agricultural productivity, and especially in helping farmers to become self-sufficient despite the diminishing amount of land accessible to them. It also organizes a women’s handicraft cooperative, promoting health education, and setting up a savings scheme to help parents pay for their children’s university education. All this depends on volunteer help without external funding. This initiative seems to worry the Israeli military intelligence, as if being a community activist is somehow subversive. Mamoun’s office has been subjected to no less than six night-time raids by the army. He and, by association, his family are on a ‘black list’. When his 64 year old father enquired as to why his application for a permit to work in Israel had been rejected the answer was “ask your son”! The planting ends ceremonially with the unfurling of a ‘solidarity’ banner and the obligatory taking of photographs. Everyone is in a jubilant mood. The trees have been planted without provoking a reaction by the settlers, and the army has kept its distance even though it has captured everything on video from beginning to end. Mamoun sums up the feeling of the workers when he says “for every one tree they [the Israeli settlers] destroy, we will plant ten trees more”. I’m convinced that against all the odds this continuing emphasis on nonviolent resistance will eventually win the day for the Palestinians as it did for Gandhi in India and Mandela in South Africa. Thomas Friedman, writing in the New York Times, about what he calls a ‘third intifada’ believes that “it is the one that Israel always feared most – not an intifada with stones or suicide bombers, but one propelled by non-violent resistance and economic boycott”. The final word naturally belongs to Mamoun: he warmly thanks our team “for your support and for showing solidarity with us”, and the other workers beam in agreement.